(Nanowerk News) When particles bond in free space, they normally create atoms or molecules. However, much more exotic bonding states can be produced inside solid objects. The result is an innovative form of light-emitting diode in which the wavelength of the desired light can be controlled with high precision. These findings have now been published in the journal Nature Communications ("Electroluminescence from multi-particle exciton complexes in transition metal dichalcogenide semiconductors"). "The excitons have a much higher bonding energy in two-dimensional layered systems than in conventional solids and are therefore considerably more stable. 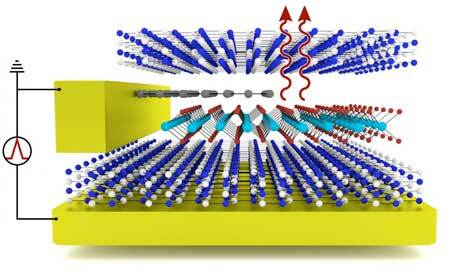 Simple bonding states consisting of electrons and holes can be demonstrated even at room temperature. Large, exciton complexes can be detected at low temperatures", reports Thomas Mueller. Different excitons complexes can be produced depending on how the system is supplied with electrical energy using short voltage pulses. When these complexes decay, they release energy in the form of light which is how the newly developed layer system works as a light-emitting diode.